A “sapsicle” hangs from a young maple in our front field. This morning in Huntington at 7:00AM it’s currently 28 degrees and snowing lightly under overcast skies. Winds are calm. Relative humidity is 88%, dewpoint 25, barometric pressure 29.77” and rising. We picked up 2.5” of new snow overnight and have 16” at the stake. Yesterday’s high was 38, and the overnight low was 28. A northwesterly airflow aloft is developing over the region this morning and this will bring drier weather and below normal temperatures to the area through Wednesday. We’ll see mostly cloudy skies this morning, then partly sunny skies later in the day. Highs will be in the mid 30s with northwest winds 10 to 15 mph. Tonight should be mostly clear and cool with lows around 15 and north winds around 10 mph until midnight, becoming light and variable. Wednesday should be mostly sunny with highs in the lower 30s and northwest winds around 10 mph. Wednesday night should be mostly clear and seasonable with lows in the lower 20s and northwest winds around 10 mph. A warm front will lift through the region on Thursday bringing mostly cloudy skies with 30% a chance of rain or snow. Highs will be in the mid to upper 40s with south winds 10 to 15 mph. A low pressure system will move through Thursday night bringing rain. Lows will be in the lower 40s. Chance of rain is 70%. Last year on this date we had a high of 34 and a low of 29. We picked up 0.13″ of rain and had 17″ of snow on the ground. Burlington norms for this date are highs of 47 and lows of 29. The record high was 84°F in 1998. The record low was 2°F in 1954. The Moon is waxing gibbous, 11d 1h old with 86% illumination. I saw this “sapsicle” from a distance while out shooting the other day. I wasn’t quite sure what it was until I got in close. 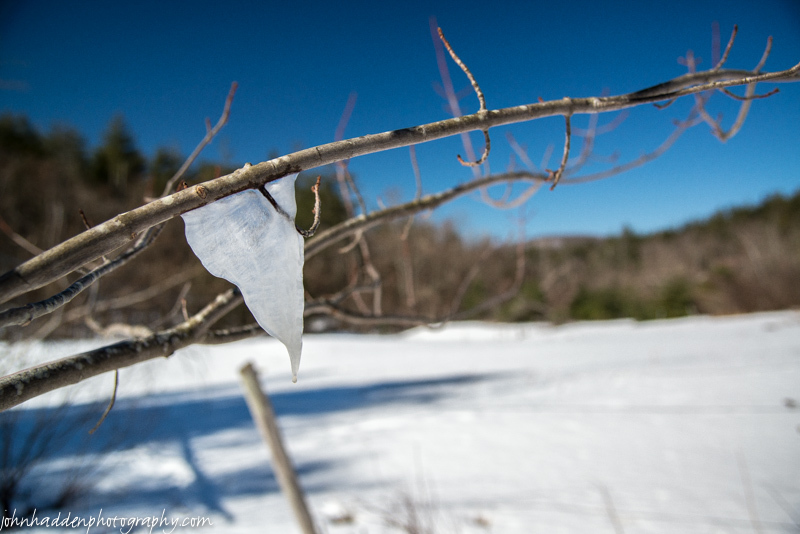 Chilly morning air had allowed the flowing sap to form a fine (and mildly sweet!) icicle hanging from a small scar on the branch. This morning in Huntington at 7:00AM it’s currently 32 degrees under overcast skies. Winds are out of the south at 3-8 mph. Relative humidity is 69%, dewpoint 23, barometric pressure 29.75” and falling rapidly. We have 13.5” of snow at the stake. Yesterday’s high was 40, and the overnight low was 32. A cold front moving east from the western Great Lakes will bring a chance of rain and snow showers to the region today. We’ll see cloudy skies with a 50% chance of snow or rain showers. Highs will be in the lower 40s with southwest winds 10 to 15 mph gusting up to 25 mph. Tonight should be cloudy with a 50% chance of rain or snow showers until midnight, then a chance of snow showers after midnight. Lows will be in the mid 20s with west winds 10 to 15 mph gusting up to 25 mph. Tuesday should be partly sunny with a 20% chance of snow showers in the morning. Highs will be in the mid 30s with northwest winds 10 to 15 mph. Tuesday night should be partly cloudy with lows around 15 and north winds around 10 mph. Dry high pressure will build in for Wednesday bringing mostly sunny skies with highs in the lower 30s and northwest winds 10 to 15 mph gusting up to 25 mph. Wednesday night should be partly cloudy with lows around 20. Last year on this date we had a high of 41 and a low of 30. We picked up 0.86″ of rain and had 18″ of snow at the stake. Burlington norms for this date are highs of 46 and lows of 28. The record high was 80°F 1977. The record low was 6°F in 1884. The Moon is waxing gibbous, 9d 1h old with 79%, illumination. 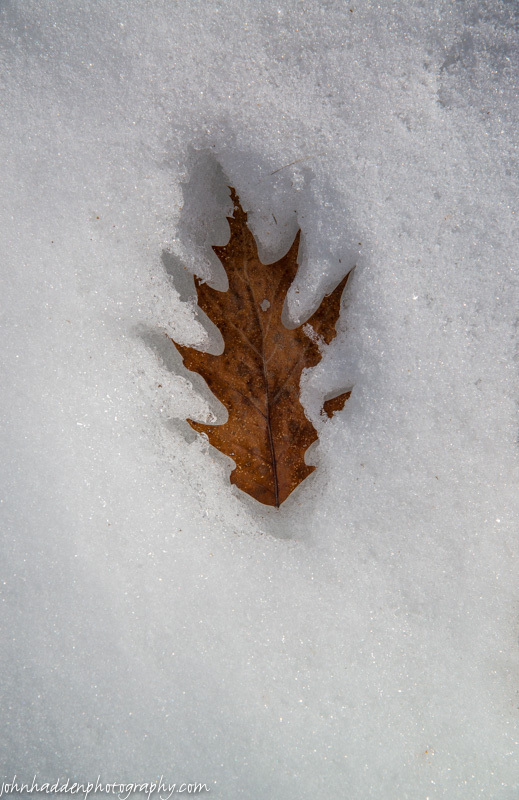 The warm March sun has real power—heating this oak leaf enough to make it melt into the snowpack! This morning in Huntington at 7:45AM it’s currently a brisk 9 degrees under clear skies. Winds are calm. Relative humidity is 91%, dewpoint 7, barometric pressure 30.22” and rising. We have 13.75” of snow at the stake. Yesterday’s high was 28, and the overnight low was 7. High pressure is currently building into the region this morning and will continue to bring clear skies and cold temperatures today. A cold front will bring a chance of rain and snow showers to the area Monday. We’ll see sunny skies today with highs in the mid 30s and light and variable winds, becoming southwesterly around 10 mph this afternoon. Tonight should be partly cloudy until midnight, then mostly cloudy with a 20% chance of snow showers after midnight as the cold front approaches. Lows will be in the mid 20s with south winds 10 to 15 mph. Monday should be cloudy with a 50% chance of snow or rain showers in the morning, then a chance of rain showers in the afternoon. Highs will be in the lower 40s with southwest winds 15 to 20 mph gusting up to 30 mph. Monday night should be cloudy with 50% a chance of snow or rain showers. Lows will be in the mid 20s with west winds 15 to 20 mph gusting up to 30 mph. Tuesday’s looking partly sunny with a 405 chance of snow showers. Highs will be in the mid 30s with northwest winds 10 to 15 mph. Tuesday night should be partly cloudy with lows 15 to 20. Last year on this date we had a high of 45 and a low of 34. We picked up 0.20″ of rain and had 21″ of snow at the stake. The record high was 84°F in 1946. The record low was -8°F in 1923. Tomorrow will be 3m4s longer. The Moon is waxing gibbous, 9d 2h old with 71% illumination. Clear, cool air moved into the region yesterday afternoon, and Camel’s Hump was revealed in its frosty coating by the late afternoon sunshine. A lovely sight driving up East Street! This morning in Huntington at 6:20AM it’s currently 22 degrees under overcast skies. Winds are calm. Relative humidity is 77%, dewpoint 16, barometric pressure 29.92” and rising. We picked up a dusting of new snow overnight and have 13.75” at the stake. We also picked up 0.05” of rain/melted precip in the past 24hrs. Yesterday’s high was 36, and the overnight low was 22. An upper level trough will swing through the region today allowing for a few isolated snow showers across eastern Vermont through the day before drier air moves into the area for the rest of the weekend. We’ll see cloudy skies with a 30% chance of snow showers mainly this morning. Highs will be in the upper 20s with north winds around 10 mph. Tonight should be partly cloudy with lows around 14 and north winds around 10 mph until midnight, becoming light and variable. High pressure will build in Sunday bringing mostly sunny skies with highs in the mid 30s and light and variable winds, becoming southwesterly around 10 mph in the afternoon. Sunday night should be partly cloudy with lows in the mid 20s and south winds 10 to 15 mph gusting up to 25 mph. A clipper system will move through the region on Monday bringing cloudy skies with a chance of rain or snow showers. Highs will be bump up into the lower 40s with southwest winds 15 to 20 mph gusting up to 30 mph. Chance of precipitation is 50%. Monday night should be cloudy with a 50% chance of snow or rain showers. Lows will be in the mid 20s. Last year on this date we had a high of 45 and a low of 31. We picked up 0.75″ of new snow and had 23″ at the stake. Burlington norms for this date are highs of 45 and lows of 27. The record high was 79°F in 1945. The record low was -5°F in 1923. The Moon is waxing gibbous, 8 days old with 61% illumination. This hole in the ice of Fargo Brook caught my eye the other day. 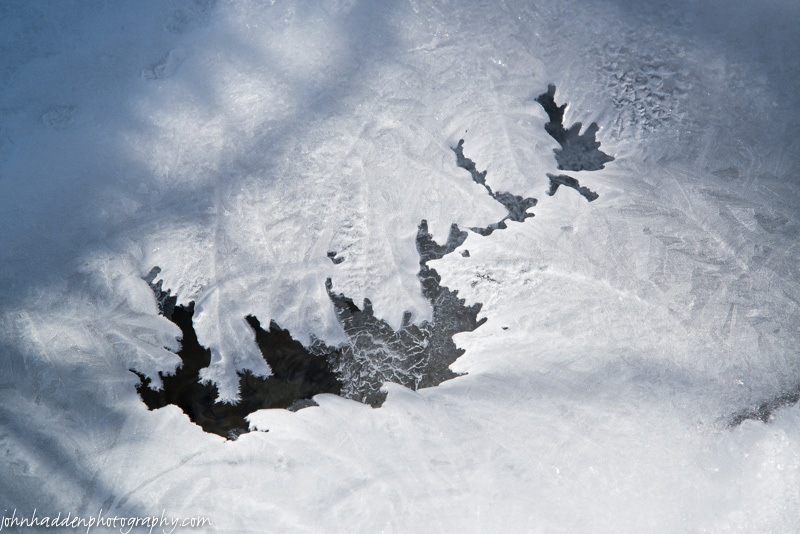 It looks to me like stacked layers of ice leaves. Nikon D600, Nikon 24-120mm lens @ 120mm, circular polarizing filter, ISO 250, f/11, 1/125″ exposure. This morning in Huntington at 8:45AM it’s currently 3 degrees and snowing lightly under overcast skies. Winds are calm. Relative humidity is 98%, dewpoint 33, barometric pressure 29.74”. We picked up 0.44” of rain in the past 24hrs and a dusting of snow. We have 13” of snow at the stake. Yesterday’s high was 46, and the overnight low was 33. Low pressure will exit the region today leading to a quiet weather pattern over the next couple of days. The drier air will lead to a return of below normal temperatures through the weekend. We’ll see mostly cloudy skies with a chance of rain or snow showers mainly this morning. Highs will be in the upper 30s with light and variable winds, becoming northwesterly around 10 mph this afternoon. Chance of precipitation is 30%. Tonight should be mostly cloudy with a 20% chance of snow showers. Lows will be around 15 with north winds around 10 mph. Saturday should be mostly cloudy with a 20% chance of snow showers. Highs will be in the upper 20s with north winds 10 to 15 mph. Saturday night should be partly cloudy with lows around 14 and northwest winds around 10 mph. Sunday’s looking mostly sunny with highs in the mid 30s and west winds around 10 mph. Sunday night should be partly cloudy with a 30% chance of snow showers as a weak trough slides through. Lows will be in the mid 20s. Last year on this date we had a high of 36 and a low of 1. We had 23″ of snow at the stake. The record high was 71°F in 1921. The record low was -1°F in 1923. The Moon is in its first quarter, 7d 3h old with 52% illumination. 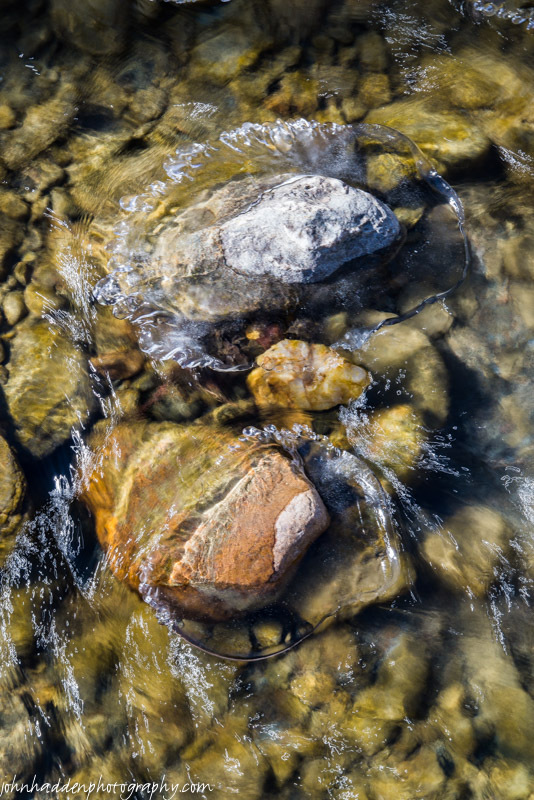 Two ice-wrapped stones curve the current in Fargo Brook. Nikon D600, Nikon 24-120mm lens @ 70mm, circular polarizing filter, ISO 250, f/20, 1/10″ exposure. This morning in Huntington at 8:10AM it’s currently a balmy 38 degrees under mostly cloudy skies. Winds are calm. Relative humidity is 91%, dewpoint 36, barometric pressure 29.87”. We picked up just a trace of rain in the past 24hrs. Snowpack is 13”. Yesterday’s high was 50, and the overnight low was 36. A cold front will bring an additional surge of rain showers to the region today before transitioning to snow showers late this evening. Behind the cold front temperatures will once again trend colder before slowly warming to near seasonable levels early next week. We’ll see rain, mainly this afternoon. Highs will be in the lower 40s with southwest winds 10 to 15 mph gusting up to 30 mph, then becoming westerly this afternoon. Chance of rain is near 100%. Tonight rain or snow are likely with total snow accumulations of a dusting to 2 inches possible overnight. Lows will be around 30 with light and variable winds. Chance of precipitation is near 100%. Friday should be mostly cloudy with a 50% chance of snow though the day. Highs will be in the upper 30s with northwest winds around 10 mph. Friday night should be partly cloudy with lows around 12 and north winds around 10 mph. Saturday’s looking partly sunny with highs in the mid 20s and northwest winds around 10 mph. Saturday night should be mostly clear wit lows 10 to 15. Last year on this date we had a high of 26 and a low of 14. We had 23″ of snow at the stake. Burlington norms for this date are highs of 44 and lows of 26. The record high was 71°F in 1945. The record low was -4°F in 1960. The Moon is a waxing crescent, 6d 2h old with 42% illumination. 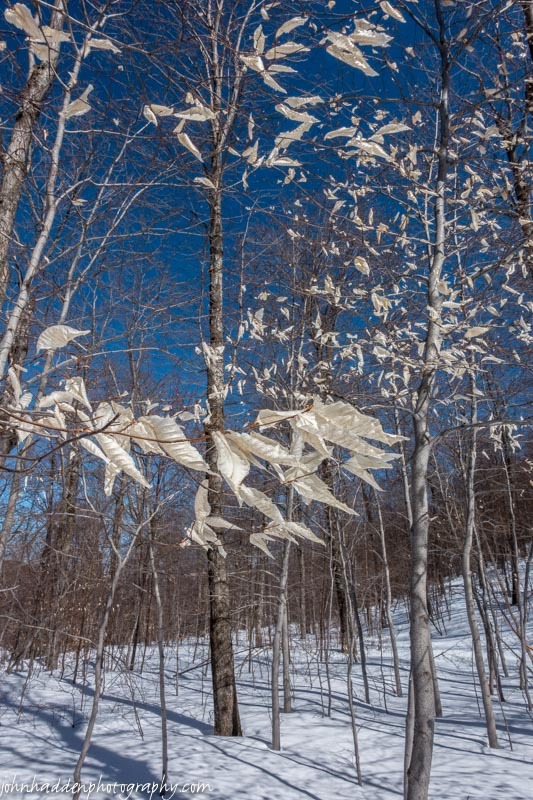 Last summer’s beech leaves are well bleached by sun and weather up in the beech grove on the west side of Crow Hill. This morning in Huntington at 6:50AM it’s currently 13 degrees under clear skies. Winds are calm. Relative humidity is 92%, dewpoint 11, barometric pressure 30.39”. Snowpack is 14.5”. Yesterday’s high was 37, and the overnight low was 13. High pressure will move east of New England today allowing for milder air to move in ahead of low pressure and an associated warm front. This system will bring periods of light rain to the area this afternoon through Thursday. A mix of rain and snow will occur Thursday night into Friday as a cold front tracks through. We’ll see sunny skies this morning, then partly sunny skies with rain showers likely this afternoon as the first of two troughs associated with the low pressure system move through. Highs will be in the mid 40s with south winds 10 to 15 mph. Chance of rain is 60%. Tonight will be cloudy with rain showers mainly until midnight. Lows will be in the mid 30s with south winds 15 to 20 mph gusting up to 30 mph. Chance of rain is 90%. Thursday will start out cloudy with rain, mainly in the afternoon, as a second trough moves through. Highs will be in the mid 40s with southwest winds 10 to 15 mph gusting up to 25 mph in the morning, then becoming light and variable. Chance of rain is 90%. Thursday night rain or snow are likely with light snow accumulations possible. Lows in the lower 30s. Light and variable winds. Chance of precipitation 90 percent. Total rainfall for this system is on the order of 0.5″ to 0.75″. Friday should bring some lingering snow showers with additional light snow accumulations possible. Expect a dusting to an inch or so in our immediate area with high amounts in mountain locations north. Highs will be in the mid 30s with north winds around 10 mph. Chance of snow is 60%. Friday night should be partly cloudy with a 40% chance of lingering snow showers. Lows will be 10 to 15 as cool high pressure builds in for the weekend. Last year on this date we had a high of 33 and a low of 0. We had 23″ of snow at the stake. The record high was 68°F in 1987. The record low was 0°F in 1960. Tomorrow will be 3m6s longer. The Moon is a waxing crescent, 5d 1h old with 31% illumination. Fargo Brook is quite the highway for critters at all times of year. With a firm crust and light dusting of snow, however, the comings and goings of a wide range of species can be read quite clearly. 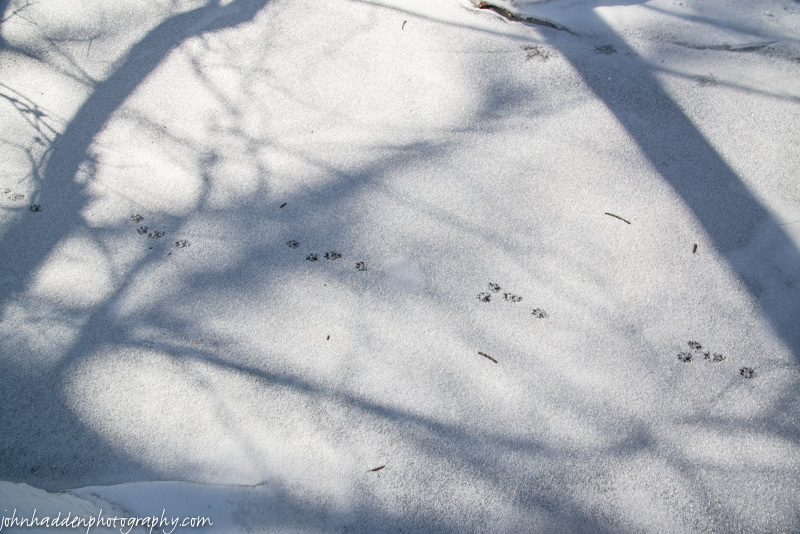 This fine set of weasel (short tailed maybe) tracks showed that their maker was moving fast upstream on the frozen surface.